The Cabo 45 Express getting a last minute check before casting off. 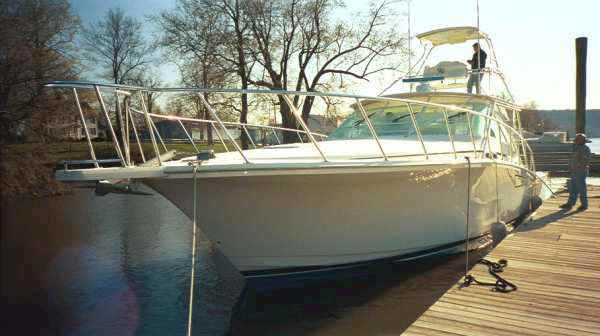 Up until the introduction the 47 Bridge boat, the 45 Express from Cabo Yachts was the queen of the Cabo fleet. Being the queen infers a royal background and there is no shortage of majesty here. This particular 45 is a 1999 model that I delivered fresh off the truck, Memorial day 1999, from Falmouth , MA to a Connecticut home port almost on the New York line. This boat's owner has some home port bridge clearance concerns which account for the lower marlin tower and the removal of the riggers. Her white hull with blue boot stripes and bottom make for a very pretty package. The tower, fabricated by J&J in Falmouth, MA is not only stylish but quite functional. 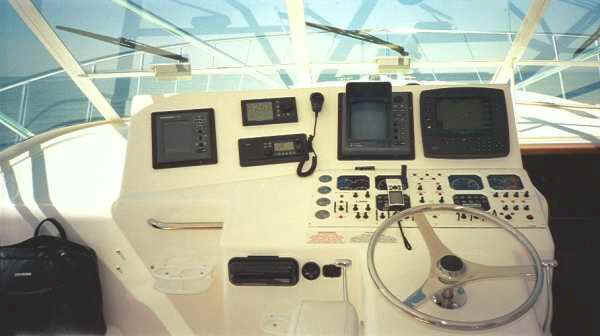 The upper controls do increase one's fish spotting ability but more importantly, provide an airy escape from the lower station's noise and windshield glare, more on that later. Our run on this cool, April morning down the flooded Connecticut river, was smooth and uneventful. The spring tides wash down a lot of debris and there was no shortage of thick logs and branches to dodge.The flood tides slowed us for the railroad bridge at Saybrook about 10 minutes as we watched the Connecticut DEP train for the up coming summer boating season. We turned to the west once we cleared Saybrook Point on a heading toward Cornfield Point, Falkners Island, Bridgeport, and finally to our Greenwich home port. Cruising this boat is a pleasure but as perfect as it may be, there are a few little things that I think should be addressed. The forward slope of the windshield and the pure white dashboard make for a lot of reflection and glare as you can see in the photo below. 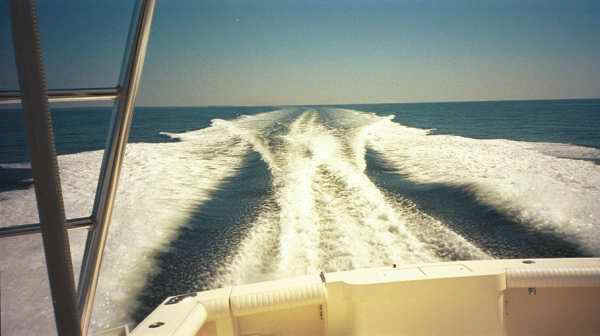 This vessel has the Stidd helm and companion seats that are very comfortable. I would have preferred a little more aft movement on the helm seat and a little more height. The compass placement is a little bit low and behind the dash to be visible while seated. I understand this has been fixed on the later models. My only other concern is the sound level on the helm deck when at cruising speed . It seems that all express, big diesel powered boats are noisier than I would prefer. A six-hour hard run in the bright sun could be quite tiring from the noise and glare. All things considered the Cabo 45 is one awesome boat! The quality of construction and material choices make her first class in every respect. A head turner in every port.